January 23, 2018 – A note from Todd Trewin, President, the Authority Board. On behalf of the Washington State Horse Park Authority Board, I’m delighted to report the Park received $2.0 million in the State’s Capital Budget that the Legislature and Governor signed into law last week. This award is designated specifically for our non-profit organization’s covered arena project. Combined with other funds already secured, we are almost 80% of the way toward the full project cost of $4.6 million for the arena and associated build out. Please read the below Press Release and related information and share the news with others you think may be interested. This new covered structure – almost an acre under one roof – will be the Park’s fifth arena and the centerpiece for many daytime and evening activities. What a wonderful new asset to be used and enjoyed by our regional horse community. I want to thank all those who have helped bring the Park to this momentous point in its evolution. You know who you are, and we hope you’re justifiably proud of this milestone. 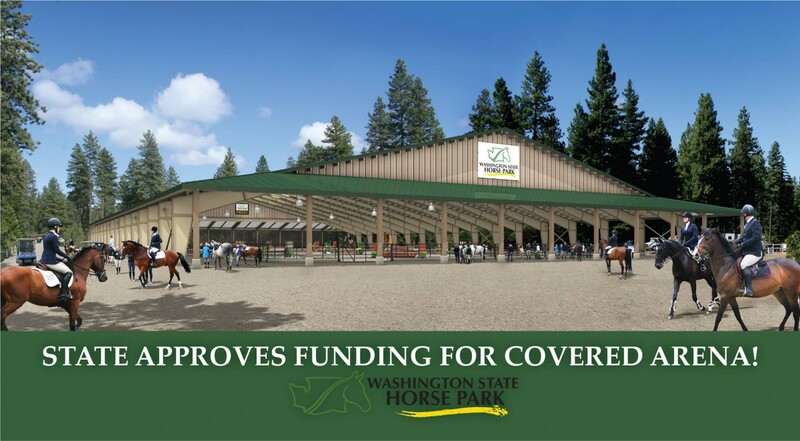 Click to read more about this wonderful addition to the Washington State Horse Park, including details on the structure and master build-out plans. Click to view the Washington State Horse Park Facebook page.